European ski resorts are expecting more snow this weekend, however, if your clients are looking for a pre-Christmas ski holiday, North America is the place to go for the best conditions. The US is looking particularly good, according to the Ski Club of Great Britain's snow update, which says conditions there are more reminiscent of mid-season than early December. At Kaprun, the upper slopes around Sonnenkar are looking in good nick, whilst snow cannons lower down are working hard to provide coverage across otherwise bare slopes. In Hintertux, there are 17 lifts running across the glacier. Kitzbuhel has good conditions for the time of year, and the four runs that are open are all well-groomed. Ischgl is expecting more snow this weekend. Other areas due to open over the weekend include Lech/Zurs and St Anton, Kuhtai and Mayrhoffen. Conditions at Tignes on the Grande Motte glacier look very good for the time of year. Lower down, snow still sits on the roofs around Les Brevieres at 1550m, though runs down to the area are yet to open. 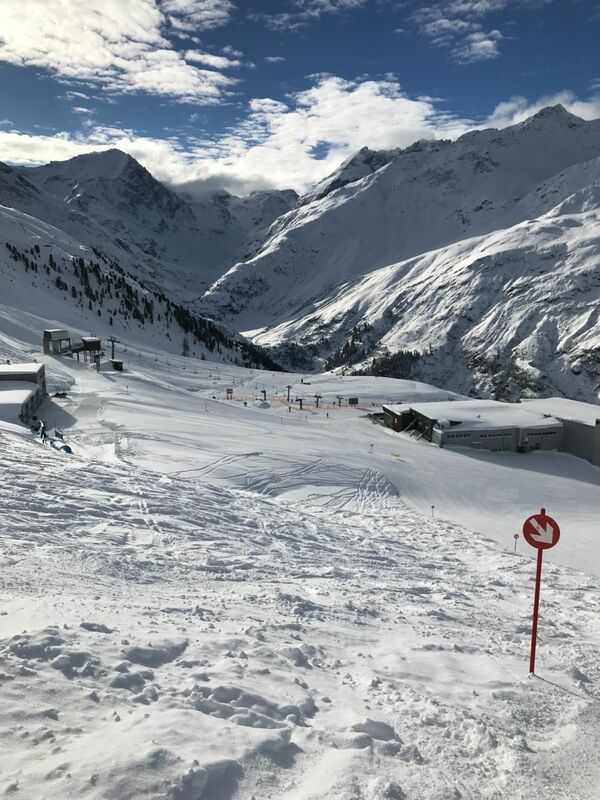 Access to the open slopes in Val d'Isere is currently via the Solaise lift in Val d'Isere itself, or by taking the Fornet from Le Fornet, with skiing available on both sides of the Cretes Des Leissieres. In the Three Valleys, Val Thorens (now has 12 out of 30 lifts running, and 17 slopes open. Meribel, Courcheval and La Tania aim to open on December 8. Much of France is forecast to receive snow on Friday, and as much as 20cm may fall at Alpe d'Huez- just in time for its first day of the season on December 1. Zermatt has the most extensive skiing right now in the Alps with 181km of pistes open. Skiing is also on offer in Davos and Engelberg and at the weekends in Andermatt and Verbier. Although there are only a handful of resorts open, they're offering some of the best skiing in Europe this week. Cervinia is now running 14 out of 15 lifts; the Monte Rosa, beginning full operations on December 1, looked fantastically placed to welcome skiers seven days a week, with a substantial amount of largely untouched snow sitting at higher altitudes. Resorts in the west of the country are forecast to receive more snow over the weekend, falling most heavily on Friday and Sunday, when more resorts will open for the season. There is currently no skiing at any of the Ski Club's featured resorts. Levi and Ruka only have farmed snow from last season, so only a handful of runs are open. Ruka offers the most skiing in Scandinavia at the moment. There is a little too in Lillehammer in Norway. There is currently no skiing at any of the Ski Club's featured Eastern European resorts. Here has been no let-up in the fantastic conditions across the USA, with the forecast snow across north California and the Sierra mountains delivering 28cm in Mammoth and there's lots more on the way, including Timberline (43cm), Heavenly (91cm), and Squaw Valley (58cm). Across the country in the northeast conditions are at least as good, if not better: Vermont and Maine have seen upwards of 20cm across the board, with as much of 50cm falling in Sunday River. Many resorts in the central Rockies also saw fresh snow, including 14cm in Jackson Hole and 15cm in Snowbird. Almost every resort in the country has opened terrain and lifts at a faster rate than planned - and there's more snow on the way. Fantastic pre-season conditions prevail across the principal skiing regions of Canada, with fresh snowfall in British Columbia, Alberta and Quebec. Banff offered the largest range of terrain, with both Sunshine Village (56cm) and Lake Louise (83cm) operating all their main lifts. After a slightly dry early November, Whistler also got some welcome snow this week. The coming weekend is expected to see some light snow showers, though temperatures will remain relatively mild, only slightly below freezing. Niseko has opened for the winter season this week, having seen a substantial amount of snowfall.